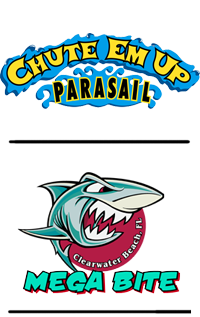 Be a part of one of Clearwater Beaches newest, exciting interactive speedboat tour attraction. Thriller begins it's twenty two mile Speedboat tour directly across the street from Florida's famous Clearwater Public Beach and Pier 60. Thriller is located in slip #7 in the Clearwater Beach Municipal Marina. Thriller is on the front row facing the Clearwater Beach public parking lot. The Thriller powerboat tour is a very unique experience. 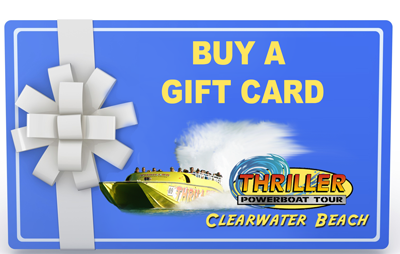 Thriller is the fastest tour boat in the Clearwater Beach area. Others make claims but we are the fastest. When Thriller is traveling north in front of Clearwater Beach, we travel at a speed of 50 miles an hour or more. You can rest assured you can do this in complete safety. Experience an unforgettable encounter with dolphins. Thriller is a speed boat first. Although, because of the length of our tour we do experience dolphins most of the time. If we do encounter them our experienced captains will do there best to get them playing and jumping in the first wake behind the boat. This is the west coast of Florida's only Offshore racing Experience. When we say experience it means you get to drive. Thriller is outfitted with two independent steering systems. This means when the captain engages you . You are in control. In addition Thriller, because of the length of the tour has about a 95% probability of encountering Dolphins. Although it is a speed boat first. Thriller is quickly becoming the areas premier dolphin encounter boat. Check Out Our Other Attractions!